Campagnolo. The name resonates in the heart of every bike aficionado, and in some cycling languages, translates to 'the best product money can buy.' For decades, Campagnolo has been at the forefront of technological innovation, continuously redefining what can be dreamed and what can be created; it has now surpassed our dreams with the creation of Electronic Power Shift, or EPS. A precise, reliable, and accurate electronic shifting system is remarkable, but it loses meaning without the touch and thrill of user engagement. The direct connection between the rider and the ride of a lifetime is at the heart of the beautiful and ergonomic Record 11 Ergopower Shifters. Record 11 EPS differs little from its big brother, Super Record 11 EPS, and the same goes for their corresponding EPS shifters. The Super Record 11 EPS Ergopower Shifters' have an almost negligible weight advantage, making the Record 11 EPS shift levers the choice for canny consumers looking to lessen the hit on the wallet of the EPS technology. Campagnolo broke the mold, quite literally, of lever design when it developed the EPS to surpass its mechanical shifters. While competitors integrated an adjustable lever position into their existing shifters' designs, Campagnolo engineers conducted studies on the ergonomic functionality of shifters to develop the e-Ergonomy Evolution, a re-design of the esteemed Ergopower Levers. Along with new dedicated hoods, the new levers follow the contours of the hand to create more contact and control, direct powerful braking, and full lever usage from any forward position on the bars, and for any hand size. The position of Lever Three, for downshifting, has also changed from the mechanical Record 11; it's now swept down into a smooth, longer contour that requires less compression, and nearly eliminates the long reach of its predecessor. 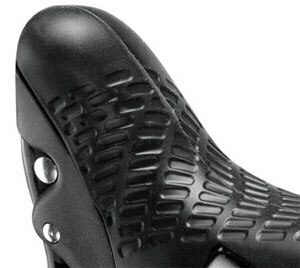 The new Lever 3 makes the downshift more accessible from deep in the drops and more comfortable from the hoods. As expected, Campagnolo engineers have gone above and beyond to accommodate Campy purists wary of electronic shifting, retaining their 'one lever, one shift' motto by developing Multidome Technology. So you don't lose the feel of mechanical shifting, the shift levers push a sensor comprised of multiple metal layers to replicate the famous 'click' feeling of mechanical versions of Campagnolo levers and to correct any shifting inaccuracies. The capabilities of Campagnolo's celebrated Multi-Shift Technologyhave also been enhanced, as Record 11 EPS permits a multiple shift through all eleven cogs, up or down the cassette, in one compression of the shifter. Compare this to the mechanical Record's Multi- Shift capacity of five cogs for the downshift and three cogs for the upshift. As a result, Record 11 EPS achieves a total cassette shift in 1.5 seconds. Another thing that we love about Campagnolo is its passion for putting the power in the hands of the user, and Record 11 EPS doesn't disappoint. New to EPS is the introduction of the Switch Mode button, conveniently located behind Lever 3 on the hoods. Switch Modelets you check battery status and engage Ride Mode to make 0.1mm adjustments to the front derailleur and 0.25mm adjustments to the rear derailleur, in seven-position increments, all in real time during a ride. Campagnolo has also spent a considerable amount of effort in protecting the smallest aspects of the shifters from extreme elements. While Campagnolo was testing a prototype of the electronic shifter in the 2005 Giro D'Italia, the electronic systems on the bikes fixed atop the team car were paralyzed by an infiltration of water from heavy rain. Although the electronic model was slated to be manufactured within the year, Campagnolo engineers started from the ground up to remedy the problem; the result is completely weather-resistant electronic shifters. Everything from the electronic board to the miniaturized harness housed inside the shifters is waterproof. The Record 11 EPS Ergopower Shift Levers can, literally, shift under water. Campagnolo has designed theRecord 11 EPS Shifters to shave considerable weight, enhance Multi Shift Technology, and improve ergonomics over earlier mechanical models. Twenty years in the making, EPS has arrived, and the Record 11 Ergopower Shifters are your ticket to ride.